“MHETase is considerably larger than PETase and even more complex. A single MHETase molecule consists of 600 amino acids, or about 4000 atoms. MHETase has a surface that is about twice as large as the surface of PETase and has therefore considerably more potential to optimize it for decomposition of PET,” explained Gert Weber, PhD, research scientist at the University of Greifswald. 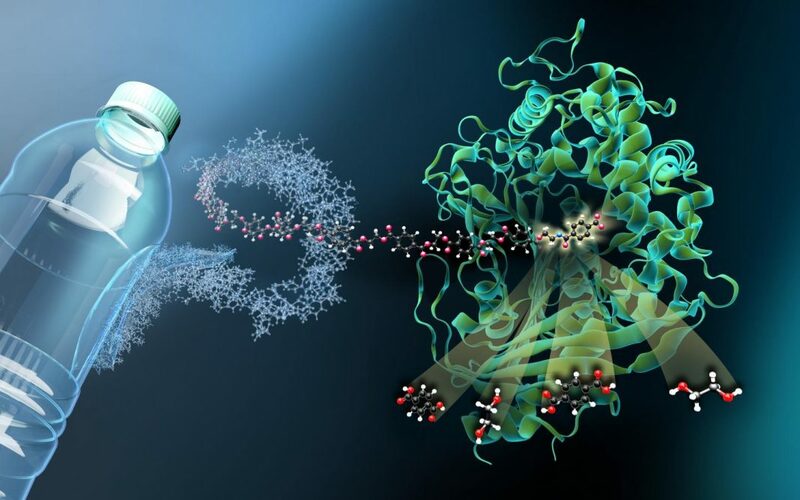 Together with Uwe Bornscheuer, PhD, a professor at the University of Greifswald, the team developed the idea of solving the structure of MHETase and then using this insight to optimize the enzyme for applications in PET recycling. To do this, they first had to extract the enzyme from bacterial cells and purify it. “In order to see how MHETase binds to PET and decomposes it, you need a fragment of plastic that binds to MHETase but is not cleaved by it,” explained Weber. They cut up a PET bottle, chemically decomposed the PET polymer and synthesized a small chemical fragment from it that binds to MHETase but can no longer be cleaved by it. From this “blocked” MHETase, tiny crystals were grown for structural investigation. “The structural investigations enabled us to watch MHETase virtually ‘at work’ and develop strategies for how to optimize this enzyme,” explained Weber. The three-dimensional architecture of MHETase actually displays some special features: enzymes such as MHETase bind to their target molecule first before a chemical reaction occurs. For breakdown of a molecule you need a tailor-made enzyme: “We can now exactly localize where the MHET molecule docks to MHETase and how MHET is then split into its two building blocks terephthalic acid and ethylene glycol,” said Weber. However, neither PETase nor MHETase are particularly efficient yet. “Plastics have only been around on this scale for a few decades—even bacteria with their rapid successions of generations and rapid adaptability have not managed to develop a perfect solution through the evolutionary process of trial and error over such a short time,” explained Weber. “Thanks to the clarification of the structure of this very important enzyme, we have now also been able to plan, produce, and biochemically characterize variants that show significantly higher activity than natural MHETase and are even active against another intermediate product of PET degradation, BHET,” added Bornscheuer. The potential use of MHETase in recycling alternative polyesters underlines the need to understand and customize binding to different substrates. The authors wrote that they “anticipate that our extensive structural characterization and initial rational modulation of MHETase substrate specificity provides an excellent starting point for the development of tailor-made, enzymatic PET degradation systems based on a MHETase scaffold and in combination with PETase.” These findings are an important step on the way to an improved PETase/MHETase system where PET recycling is decoupled from its dependence on crude oil in an energy-saving and sustainable manner.